The long, dry season, mid – July, Maasai Mara, Kenya. A basking crocodile was waiting for the herds to cross the Mara River. A sixteen-foot monster with the jaws of a bulldozer, it just lay there, never seeming to worry or be in a hurry: the herds will come when they come. Made me wonder what it was thinking as it waited. The long rains, late May, Maasai Mara, Kenya. The sense of security imparted to the young in an elephant family is striking. This small baby ran gleefully to the mud, going down on its knees, rolling in the mud and raising its trunk. It obviously felt completely secure and content amidst legs and trunks, safe in the knowledge that its mother was nearby. I feel that this resulting photograph has the hint of a tableaux. The long, dry season, late June, Maasai Mara, Kenya. It was another sun drenched day. There was not a breeze either. At mid – morning I spotted this 15 feet tall bull giraffe walking with all the dignity in the world. 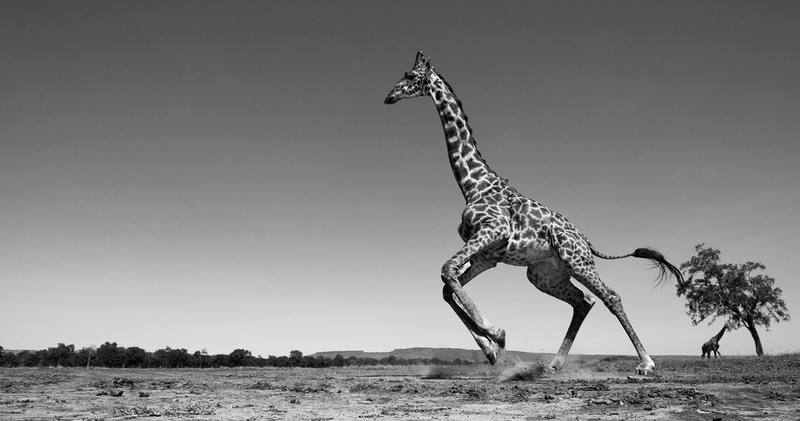 Then, as I saw this giraffe run I imagined it lashing out at a lion and killing it with one blow of its feet. I also imagined it was trying to fly. 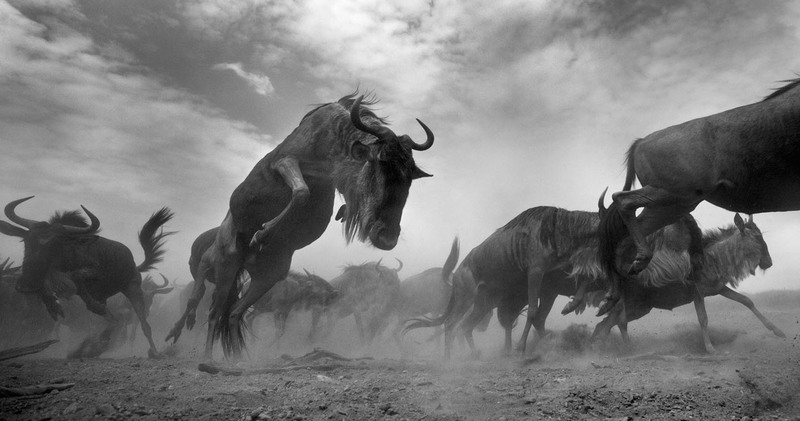 It conjured up a tremendous image of freedom – a symbol of what the Mara means to me. The long, dry season, early July, Maasai Mara. It is sometimes the case that when the sky is clear blue, it feels deeper. It also felt taller as I waited for this composition to come together. I could hear the sound of running hooves and then saw the herd running at full speed, slowing down, then picking up pace again. They almost seemed insane, their souls possessed. These migrants don’t think of time, don’t have deadlines, they just drive on in their thousands, young and old, timid and bold. 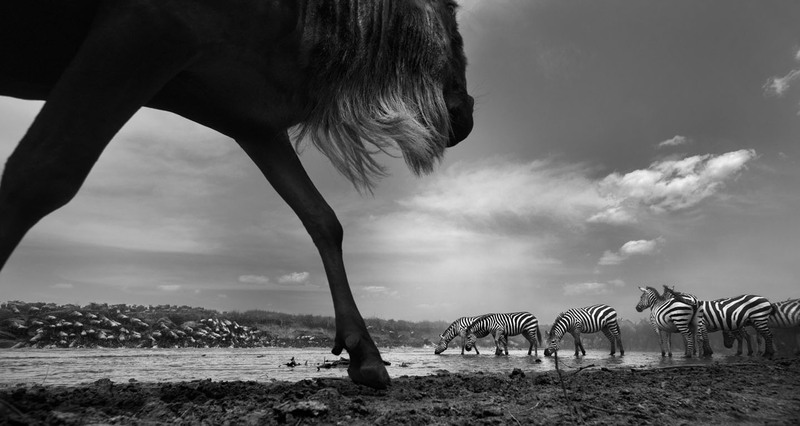 The scene before me unfolded – wildebeests following zebras to the river, the animals looking for a safe crossing point, mindful of the lurking crocodiles in the water. I saw possibilities for a photograph of racing zebras and placed the camera where I thought they might run past, which they did eventually. The short dry season, early January, Maasai Mara, Kenya. Driving along a well-beaten track, a fracture on the land’s tissue, I went to the bend in the river where giraffes haunt the gallery forest and sometimes come out on the adjoining plain. They duly appeared, gracefully, arranging themselves around a few trees that defiantly grow on the shallow soil of the plain. With deliberate dignity, two bulls detached themselves to engage in a choreographed necking duel. There were no winners, but then that was not the point. The short dry season, early March, Maasai Mara, Kenya. 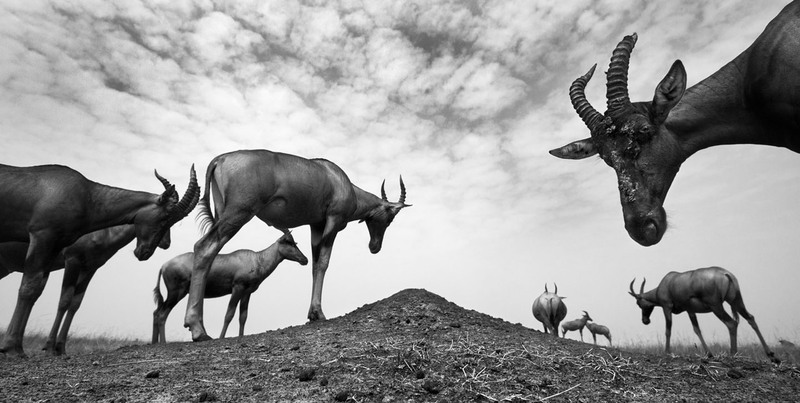 On a windless March morning I found lean and sleek topi antelopes gathered on the plain. The Mara is a traditional breeding ground for the topi. They come together once a year, for just over a month, to mate. It is not uncommon to see males collapsing with exhaustion as the demands of the females get too much for them. I like the way that they stand like statues in this photograph. The long, dry season, mid – July, Maasai Mara. The river was low and languid and the smug hippos were basking on the soft beach, occasionally grunting in response to grunts they heard from further up river. 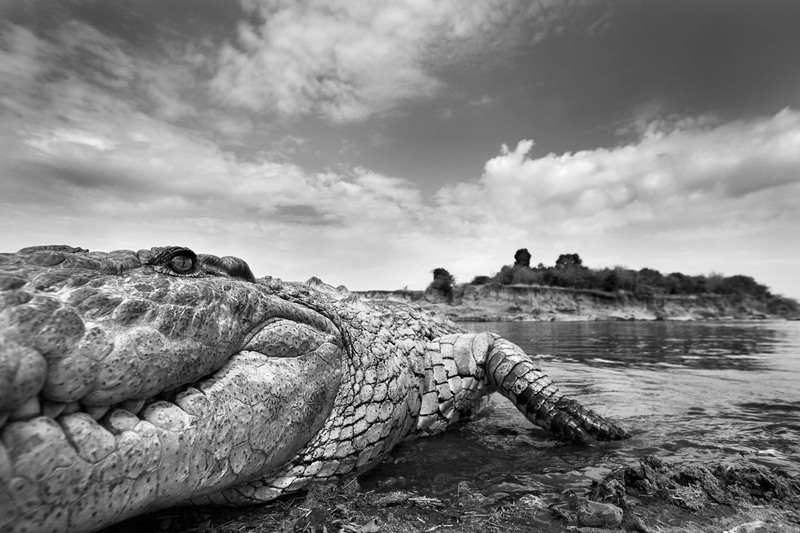 A few crocodiles were swimming lazily, their wet snouts above the calm water surface. In due course, a herd of wildebeest and zebra arrived and cantered to the beach. They had come to cross the river. The lead animals hesitated but eventually one animal took the plunge. Others followed even as the crocodiles closed in. The long, dry season, mid – July, Maasai Mara, Kenya. The bulk of the herd was out of the hole and on the move. It rolled on to the centre of the plain, moving at a steady canter. A few animals appeared injured and there were mums without their babies and babies without their mums. Some animals had been left struggling up the wall that is the river bank and a couple got snapped by crocodiles. Several drowned and soon had vultures dancing on their floating bellies. I hope the viewer feels that he/she is in the midst of the panicked herd. The long rains, mid – May, Maasai Mara, Kenya. Whereas a lion cub reaches adulthood within three years, an elephant calf will take about 18 years and, just like a human baby, will be almost completely reliant on its mother and the rest of its family for this initial phase of its life. The short rains, early November, Maasai Mara, Kenya. The rainy season finally started. There was the wonder of seemingly spontaneous growth that renews life all over again. Animals, previously confined to small areas where food was accessible, began to scatter. For the giraffes, however, there was little change in their movements. It would take some time before trees in their home range sprouted new leaves. 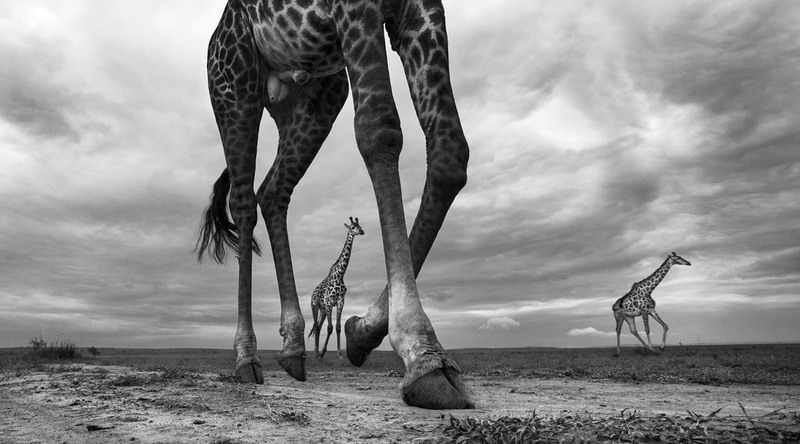 In this photograph, I like the way scale is captured using the tallest animal on earth. The short dry season, early March, Maasai Mara, Kenya. The transition from February to March is marked by the entrance of more and more clouds on the background stage set in the sky above. Wispy actors. No dark, forbidding, threatening characters yet. Meanwhile, the play on earth continued as I watched an elephant family at a dirt hole one early March evening. Engrossed, they were digging dirt out, one and all. But wait, the matriarch had her eye on me. It was uncanny, but I sensed that I was being watched. Short dry season, late December, Maasai Mara, Kenya. An afternoon sky threatening heavy downpour. Then, an elephant family appeared. It calmly went about with the daily task of living in the wild. 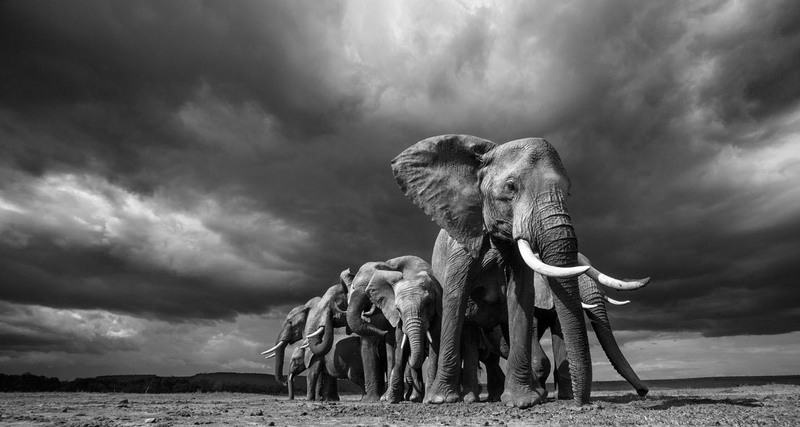 Inspired by the atmosphere, I set up the shot such that the photograph would speak of both raw nature and tranquillity emanating from the elephant family serene against the impending storm.